It is a painful paradox: utopian thinkers seem to be very tolerant and dreamy people, but at the same time they build their utopias on secret islands and surround themselves by followers. Plato’s Perfect State was a closed and stratified social system. Thomas More’s Utopia an island. In case of overpopulation, Sir Thomas More suggests to: ‘draw out a number of their citizens out of the several towns, and sent them over to the neighbouring continent.’ And Ayn Rand’s solution in Atlas Shrugged is a secret and separate withdrawal place called Atlantis, for like-minded entrepreneurs. I discuss their books in Short history of Utopia. This e-book will be published soon, this March 2013, in Collca’s series BiteSize Science. The fact that utopias are behind walls is in fact already implied by the word closely connected to Utopia: Paradise. ‘Paradise’ stems from the old Persian word ‘paira-deaza’, which means ‘walled space, park, garden’. The garden of Eden was a separate space. Medieval towns have walls and gates. And to take an enormous leap forwards: the Internet is fire-walled. It seems a universal phenomenon: people who advocate openness at the same time protect their ‘own’ backyards. Just a short dive into history. From the south of Togo stems the story of the third space, the underworld. It is a simple and enlightening story. Heaven and earth are the second and first spaces. In the third space, the underworld, different death cities celebrate one’s arrival. No-one can leave and visit other cities. And this is how ‘the murderer’, ‘the unworthy’ and ‘the good’ live in separate spaces. Paradise is the upside down world of daily, exhausting life. Wouldn’t it be comfortable to be surrounded by the food and drink you like, the people you love and just celebrate together, safe and happy? Wouldn’t it be great to have murderers live in separate places? Does this mean utopias predominantly are dreams about gated communities? Are people inclined to design superficial societies behind walls? This question really bothered me since I wrote the last sentences of Short History of Utopia. It did not fit in with my idealistic view of writers of utopias. The only way to understand this painful paradox is to remember that utopias are dreams of how society could function. We need those dreams. They are playgrounds where hope and fantasy develop in a safe – and okay, gated – environment. At the utopian playgrounds we can rethink consequences of population pressure, or dangers of a dominant technology. Or we can just design the good life. Utopia is a superficial society. Just let us make sure that these dreams are told and shared. More, Thomas. 1516. Utopia. 1997 edition. Mineola,New York: Dover Publications. Steinwede, Dietrich, und Först, Dietmar. 2005. Die Jenseitsmythen der Menschheit. Düsseldorf: Patmos. Yutang, Lin. 1955. 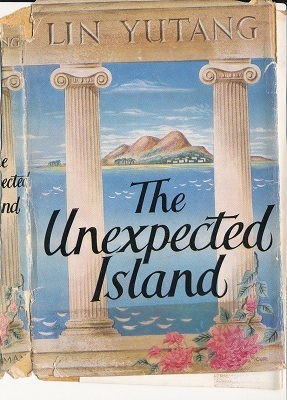 The unexpected island. Melbourne, London, Toronto: William Heinemann.